A look back at quite possibly the greatest year in independent college rock and roll. There’s so much great new music out there that this month’s new release episode has been expanded to two weeks. Part 1 is highlighted by a number of tracks from a great triple disc set designed to help pay off the medical bills of legendary rocker Sonny Vincent. The first three months of 2019 has seen a ton of great new records. Tonight Scott Hudson plays tracks off those who have caught his ear. Celebrate the St. Patrick’s Day weekend with these booze-oriented tracks. Two hours of the best tracks from recent box sets and other sorts of compilations. The first Friday of every month is devoted to new releases, and there’s a ton of great music to check out this month. Scott’s folder of new cover songs was full so it’s time for a show of nothing but reworked songs. Two hours of great new music! Five acts from six different indie labels are highlighted this week. A look at British punk rock singles released in the first half of 1979. With the help of Live Ledge listeners, awards are given out to the best music of 2018. The first show of 2019 is also the first new release episode of the year! A continuation of last week’s new release episode, plus an hour of new rock and roll Christmas songs! Tonight’s supersized show features a tribute to the late, great Pete Shelley, along with tons of new releases. Two more hours of alternative and punk tracks from 1983! The final chapter in the 1978 series focuses on mainland Europe. It’s a supersized episode of brand new releases. It’s the annual Live Ledge Halloween rock and roll party! Emptying the folder, so to speak, of cover tunes collected over the last few months. The second episode of a two-part series of brand new tunes. It’s not the usual nostalgic look at the past as we only go back five years on this episode, but there was so much great rock and roll that year. What has Scott been listening to lately? Tune into this episode to find out! The first Friday of every month is devoted to nothing but new releases, and this month is no different! Continuing the series of shows looking at the great music of 1978, tonight’s episode focuses on more UK tracks from the year. A look at political themes throughout the history of rock and roll. The first Friday of every month is a rundown of brand new releases! This week we take a look back at the great indie, punk, and college rock from 1983! Continuing the series of shows focused on the magical year of 1978, this episode share classic punk tracks from New York, Boston, Washington, DC, and Canada. A look at the state of music at the halfway mark of 2018. We’re almost halfway through 2018 so it’s a good time to compile all the best archive releases for the year so far. Let’s celebrate summer with a Live Ledge beach party! The first Friday of every month is always devoted to new releases, and this supersized June 1 edition is no different! Two hours of some great recently discovered covers of great tunes, including a few surprises! A week later than usual host Scott Hudson goes through the latest new releases. The “first Friday” of every month is devoted to new releases! 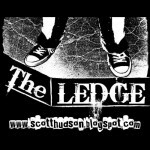 Live Ledge celebrates a punk rock St. Patrick’s Day! It’s part two of a two part series on fantastic recent musical comebacks. A look at some of the artists who have recently released some of their best music in years. A momentous year in music for host Scott Hudson, as it was for music freaks everywhere. Host Scott Hudson has scoured dozens of year-end lists to find this show full of records he missed through the course of 2017. Punk rock and Halloween go together like my favorite whiskey and Coke, so here’s another edition of the annual Halloween show. Inspired by Billy Bragg’s new book, tonight’s Live Ledge is two hours of skiffle music! Two hours of great indie and punk releases from 2007! An evening of great songs in alphabetical order! It’s been a great year for music, as evidenced by this marathon look at the first six months of 2017. More tracks from that fun, fun year of 1987! Another set of fabulous new music and reissues! It’s a supersized episode of brand new material on tonight’s Live Ledge. Host Scott Hudson talks to vocalist/guitarist Jason Balla to promote their upcoming show at Total Drag in Sioux Falls, SD. It’s a super-strong 2 hours of brand new music by old and new artists! Tonight is a celebration of a momentous year for indie and alternative rock – 1987. Bloodshot Records singer/songwriter Cory Branan chats about his upcoming album, Adios. In support of the fine folks that have suffered due to that incident in Sweden, tonight’s show is a telethon of sorts. Along with continuing on from last week’s incomplete New Release episode, host Scott Hudson also interviews singer/songwriter Robert Ellis. Scott Hudson’s look back 40 years to 1977’s music scene continues in this episode. Tonight’s show is all about the records that did not make Scott Hudson’s Best of 2016 list! After a one-week delay, Hudson finally presents his final New Release episode of 2016! The title means nothing, or does it? Another show of nothing but female-led rock and roll bands. Tommy Stinson talks to Scott Hudson about the rebirth of Bash and Pop, the Replacements reunion tour, and many other topics regarding his long career. The first show of September means it’s time for a first glance at fall new releases, including upcoming records by Wilco and Drive-By Truckers! Since so many truly important tracks were not played last week, it was decided to dedicate one more show to songs with other artists in the title. Two hours of songs that mention other artists in the title! Over two hours of the seventh tracks of host Scott Hudson’s favorite records. We go back 40 years for some of the best rock and punk from 1976. A pretty rocking set of new music highlights this look at recent and future album releases. Part one of a series of shows investigating whether author Jon Savage is correct in calling 1966 the greatest year of rock and roll. Box sets, tribute records, and other sorts of compilations are the subject of tonight’s show. A super-sized show highlighting some of the great music that has been released in the past few weeks. Two hours of this year’s Record Store Day release highlights. Tonight’s show is a tribute to Prince, plus some fabulous Record Store Day finds. 50 years of great music from the Twin Cities of Minnesota are celebrated tonight. Sorry for the delay – there’s been RSS issues. Even though the big day was yesterday, why not continue the St. Patrick’s Day celebration with a ton of Pogues covers (and much more). Host Scott Hudson shares some of his favorite bands and tracks from a very underrated 1986. Throughout rock and roll history, the BBC has been a legendary source for special live releases. The finale of a three-part series devoted to the first sounds you hear on your favorite records. Part one of a two part series investigating the great first songs on classic records. Albums that didn’t make the best of 2015 list, along with the premiere of trailers for the Who Is Lydia Loveless documentary. The last new release episode of 2015 features lots of great tunes that just may end up on my 2015 compilation. A post-Thanksgiving episode celebrating just a few of the artists I’m thankful to have in my life. Another month, another show of nothing but brand new music. We continue the journey of a song from every year host Scott Hudson’s been alive, including two from 2015. To celebrate a birthday, Hudson starts a two-part series where he plays one song from every year he’s lived. Tim Kasher from The Good Life is tonight’s special guest. Hudson’s interview with Sarah Bethe Nelson is aired, along with a discussion on touring with Lydia Loveless for a week. To celebrate the sixth month of the year, tonight’s show is nothing but the sixth tracks of fantastic albums. Twin Peaks bassist Jack Dolan is interviewed by Live Ledge host Scott Hudson. Host Scott Hudson shares some of his Record Store Day haul, along with a discussion on the latest Replacements’ shows! Another month, another show of nothing but brand new music! Completing a trio of shows, tonight’s playlist features nothing but three consecutive classic tracks in a row. The second part of three episodes where host Hudson highlights albums that featured three classic tunes in a row. Nothing but classic albums with three classic songs in a row. To celebrate the releases of volumes 9 and 10 of the influential Back From the Grave compilations, host Scott Hudson plays tracks from each release. Scott plays tracks from his new obsession – vinyl records! The first new release showcase of 2015!